Due to licensing issues some competitions and clubs have fake names in FM 2015. For instance all the clubs in the German Bundesliga have fake names, the English Premier League is called “Premier Division”, the German national team has fake players. 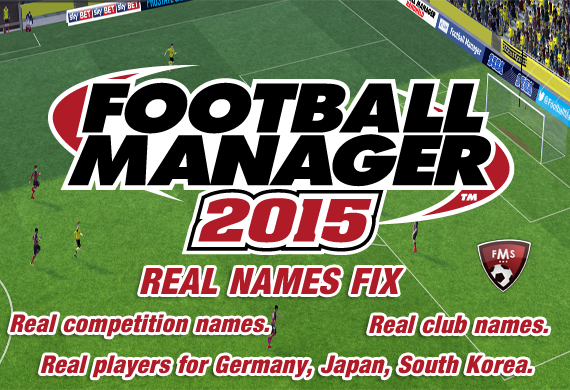 All these issues can be solved easily with our FM 2015 Real Names Fix, download, install it with our step by step instructions and enjoy a more realistic game! Get real names in Football Manager 2015, replacing “Premier Division” with “Premier League“, “Champions Cup” with “UEFA Champions League” and much more. Several real competition names are included in this fix, along with real award names and real players in the Germany national team, South Korea national team and Japan national team. And many more, including real names for all European and South American domestic competitions. Real names for Bundesliga and 2. Bundesliga clubs, including FC Bayern Munchen, Borussia Dortmund and Schalke 04. Real players in Germany national team. Real players in Japan national team. Real players in South Korea national team. * – Real players will appear after a squad is selected for an international match. 2. If asked whether you want to overwrite any existing files in that folder, select “yes”. 3. That’s it, start or re-start your game and enjoy! If you spot any teams or competitions in FM 2015 that need name changing, please let me know and I will release a new version of this download to fix them. I don’t have any files in the “steamapps” folder… where should i extract the “all” file ? Make sure you have followed the path correctly, I don’t see how a legal copy of the game could work if there’s nothing in your steamapps folder. Then the correct “steamapps” folder should be on that hard disk. I also didn’t have the folder called all in the above mentioned path. It is located in the Inc folder. Any idea on how to do this on mac? Yes, you should look into USERNAME Library Application Support Steam SteamApps Common Football Manager 2015 Data db 1500. In theory that’s where you will find the folder that you have to replace with the downloaded one. Any plans for fixing Japan club names? I can try to do that if there is demand, sure. I am confused on why you need to DL this and replace the “ALL” folder. You do realize that all you need to do is go in and delete that folder that it unlocks everything. That is all. You don’t need to DL any type of fix. The files are a lock sorta speak, and once you delete them, there is no longer a lock or name change. So what am I missing buy just deleting the files rather than replacing them with your files? I installed it like described above. The names of the competitions and the clubs are fixed but there are still fake names in the German and Japanees national team. South Korea is fixed. Can anyone tell me why the fix don’t work with the German and Japan national team?? As said in the post, you will have to wait until they select a squad for a match, they should be fixed. Did the same but no changes, still fake player names.. Fake player names in which teams? Cant find my library folder. Using Mac OS X Yosemite. You could fix the names of the players of série a Brazilian? Please give me a few more details about which are fake and I’ll do it. Real players will appear after a squad is selected for an international match. Give me an example of a fake name so that I can understand exactly what the problem is. Tried with Chelsea and Djurgården, still fake names. If you have fake player names in your squad that might be because you don’t own a legal copy of the game. If you mean club or competition names, please give me more details. Using OSX yosemite and there’s no steamapps folder in my library>application support anybody else had this problem? If so how did you solve it? On Yosemite Tthe Library folder is hidden. Click the desktop to make sure you’re in the Finder, hold down the Option key, then choose Go > Library. Yes, we only work with legal copies of the game. and the file work if im in middle of the season or i should start a new game in football manager career? No, you don’t have to start a new save. When this is applied to 15.3.0 patch, many clubs lose their nicknames. Can you give me one or two examples? That shouldn’t happen because these files have nothing to do with the nicknames. I didn’t have too much time, but just loaded top tiers of England, Germany, France, Italy, Portugal, Ukraine, Holland. England, Italy, Spain and France seems fine, in Germany: Wolfsburg, Dortmund, Schalke, Mainz, Augsburg and few others; in Holland: AZ, Groningen, Twente, Utretcht and few others; In Portuga: Benfica, Braga, Porto and few others; InUkraine: Dynamo Kiev,Illichivets, Metalist, Dnipro. Actually, I just checked my 15.0.0 (with name fix applied) save and clubs like Schalke, Dortmund, Dnipro, Dynamo Kiev don’t have one there either, so maybe they never had one. Though, I know that FM14 had them. That might be the case due to licensing reasons. All I know is that when I made the files for the fix I never entered or altered any nicknames. Sorry about that, I didn’t know. I have question this folder is really hard to find on Windows 8 , can you give me a hint or something else to try to do that thing, pls ? Thanks. It should be in the same place, either Program Files on Program Files (x86) if you are using a 64-bit version of Windows. If you still can’t find it you can always use the search feature to look for it. Nope, players should not disappear. Savitskiy does not feature in any new games with the latest patch. Sorry, can’t help if you have a pirated copy. I beggin` you just tell me is it possible to do, with pirated version? And if you know how, please tell me. Please..